Mongolia travel | Mongolia experiential tours & holidays - Mongolian Traditional Dwelling "Ger" - Travel to Mongolia with Premium Travel Mongolia. We provide experiential & unique tours in Mongolia, organize MICE travel, and offer travel consulting service. Not much is known about energy use and comfort in gers. A team hopes to change that with their on-the-ground research in the coldest capital city in the world, as well as in Philadelphia. Gers, called yurts in Russian, are the traditional one-room round, tent dwellings of Mongolian herders. 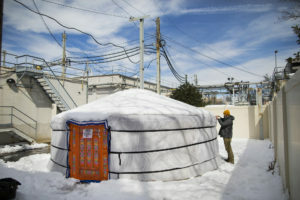 In the last twenty years, about half of Mongolia’s population has settled in permanent “ger districts” around the capital city of Ulaanbaatar, bringing their nomadic tents with them. Mongolia has an extremely harsh winter climate—mid-winter temperatures in the capital regularly drop as low as minus-40 degrees Fahrenheit. Residents stay warm by burning wood and unrefined coal, making Ulaanbaatar one of the most polluted cities in the world and improvements in ger heating a top priority. But not much formal information exists about the thermal characteristics of gers, in terms of energy use and interior comfort. Now, researchers from the Center for Environmental Building and Design(CEBD) in the School of Design, working with the Mongolian non-profit GerHub, are auditing these things to understand ger thermal behavior and identify opportunities to improve comfort, durability, and energy performance. 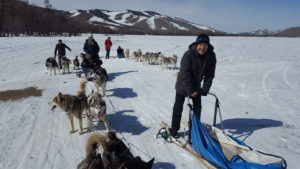 While in Mongolia, the team got to travel by dogsled. The country has an extremely harsh winter climate—mid-winter temperatures in Ulaanbaatar can drop as low as minus-40 degrees Fahrenheit. 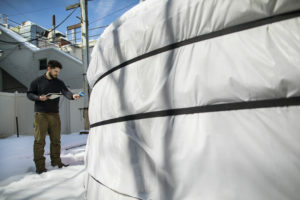 Upon returning to Philadelphia, Ayodh Kamath and Evan Oskierko-Jeznacki, Ph.D. fellows and research associates in the CEBD, assembled the ger to study how to make these traditional tents more comfortable, energy-efficient, and better insulated against the cold. Professor of Architecture and CEBD Director William W. Braham oversees the research project, which is funded by the Provost Office’s Global Engagement Fund. Information gleaned from the ger test site in Philadelphia will help the team advise GerHub, led by Badruun Gardi. Lightweight gers have little capacity to retain heat, making the thermal properties of their construction and air-sealing critical to their energy use. Interior comfort and air quality are equally important. The interior temperatures are limited by the leakiness of the gers’ tent-like enclosure, which also serve to ventilate residual smoke and ash from wood and coal burning stoves. Real energy savings and pollution reduction can only be achieved by lowering fuel consumption. The first phase of the Philadelphia project has been to monitor and evaluate the thermal properties of the ger. In Mongolia, simple monitoring packages were initially installed in four gers, and an additional five had similar packages installed by a team from Stanford. The ger site in Philadelphia has multiple sensors installed throughout the structure to study the complex thermal behavior, and data is drawn from a weather station on top of Meyerson Hall. Findings so far have focused on the performance of the ger assembly itself, and the operation of the ger in the field, both of which are important to understanding the structure, yet require different methods to evaluate. The ger in Philadelphia after a recent snowstorm. Oskierko-Jeznacki says they are still collecting and parsing through data from Philadelphia and Ulaanbaatar that will help them understand thermal behavior of gers and define performative metrics for evaluating gers in the field. 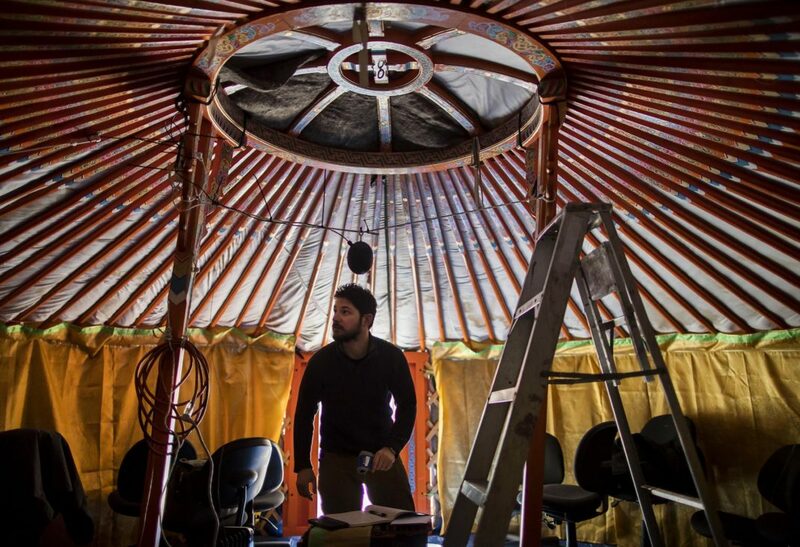 The most significant insight is something the team had hypothesized before their recent trip to Mongolia, notes Oskierko-Jeznacki: Recorded thermal performance and indoor air quality readings vary significantly due to variations in operative and occupancy schedules. Evan Oskierko-Jeznacki, a Ph.D. fellow and research associate in PennDesign, tightens the straps on the ger at the Pennovation Center. “In looking at preliminary data from [Ulaanbaatar], there are at least five or six different operative behaviors, some of which we cannot yet but hope to soon explain,” he says. “For instance, we initially hypothesized that a spike in temperature would correlate with a spike in indoor CO2, which is generally not the case—as when the stove is firing, there is a higher infiltration rate into the space, diluting the CO2 concentration. CO2 generally builds overnight, when the door/roof flap is not being opened, and the stove is still firing.”Braham says the next step in the project is the development of a simple one-time procedure to audit a ger’s thermal performance with a simple cool-down test. A real-time tool, or a “Fitbit for a ger,” would let occupants regularly measure the cool-down time in the structure and compare them to cool-down times identified in the audit. Braham points out that one of the weak points in current ger assemblies is the floor, which is typically cold, and historically not something the nomadic Mongolia herders could control. A cold floor dramatically changes the perception of temperature and experience of comfort, even when the air is warm.